Fixed prosthodontics in dentistry is a technique used to restore teeth, using fixed restorations (also referred to as indirect restorations), which include crowns, bridges, inlays, onlays, and veneers. Fixed prosthodontics can be used to restore single or multiple teeth, spanning areas where teeth have been lost. In general, the main advantages of fixed prosthodontics when compared to direct restorations is the superior strength when used in large restorations, and the ability to create an aesthetic looking tooth. As with any dental restoration, principles used to determine the appropriate restoration involves consideration of the materials to be used, extent of tooth destruction, orientation and location of tooth, and condition of neighboring teeth. 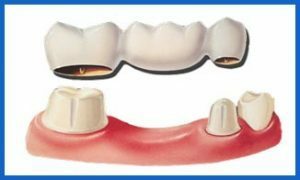 Permanent crowns can be made from stainless steel, all metal (such as gold or another alloy), porcelain-fused-to-metal, all resin, or all ceramic. Porcelain-fused-to-metal dental crowns can be color matched to your adjacent teeth. Next to all-ceramic crowns, porcelain-fused-to-metal crowns look most like normal teeth. However, sometimes the metal underlying the crown's porcelain can show through as a dark line, especially at the gum line and even more so if your gums recede. These crowns can be a good choice for front or back teeth.